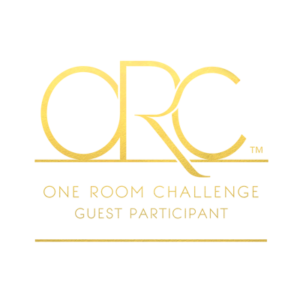 I do not know how we are already at week two of the One Room Challenge (Fall Edition), wasn’t it just summer? In any case it is that time to share with y’all what has been going on in the room. Honestly, it has been a very slow process (which makes me a tad bit nervous) I know it’ll all come together but I can’t help but think I’ll be pushing the wire on this one. Firstly, if you are unfamiliar to what the One Room Challenge is, it is a challenge hosted by Calling it Home, where she challenges bloggers to tackle one room in their house and renovate/decorate in just 6 weeks! I first learned about this challenge last Spring and decided super last minute to participate (and I am so glad I did). For that challenge I redecorated our master bedroom which you can see here and I was so impressed by the motivation that this challenge gave me, I knew I wanted to take part in the fall challenge. So fast forward to today and here I am. You can follow along with me through the entire six weeks down below. So, I guess you want to know how the progress is going and what I have actually been up to, well……I am the most indecisive person on the planet. I can not (and I STRESS) CAN NOT make my mind up when it comes to some thing as important as paint color. To me, even though I know that paint is one of the things that can be changed, I want the color to be perfect and because I do not actually enjoy painting I want to only have to do it once. 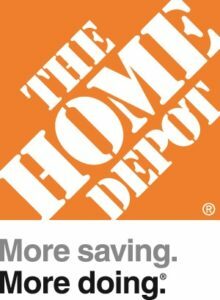 This is where the lovely associates from The Home Depot Canada come into play. There are so many choices and selections of paint to choose from and these paints can fit any budget. 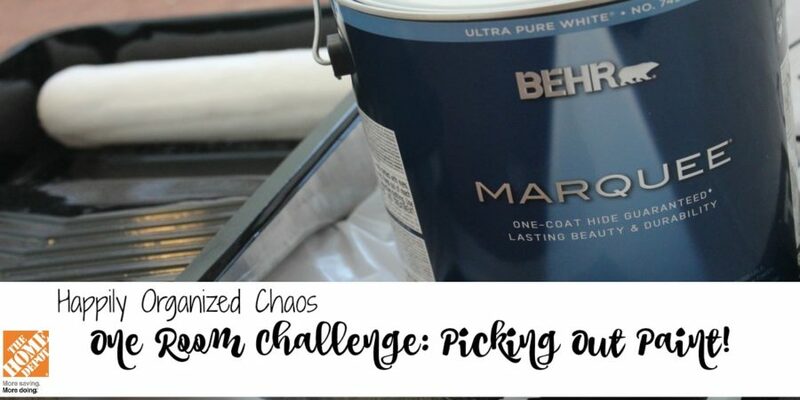 Not only can you find paint for walls, doors and trim but you can also find specialty paints, such as chalk paint and I am so grateful to be partnering with The Home Depot Canada for this challenge. I had a very specific color in mind when I was designing the plan for Madeline’s bedroom. I wanted something that was light and fresh and had a mint/grey undertone, such a high order to fill. 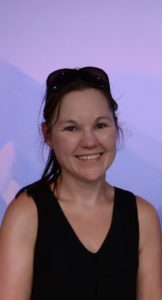 I went into my local store and had a chat with JoAnne, she was so helpful and friendly, which made my shopping experience so enjoyable. I decided that I was going to take a bunch of the sample jars home with me before I committed to one color and sadly all of those colors were just not the one. (but how perfect is it that you do not need to buy a whole gallon of paint, you can purchase one of these sample jars for under $5). 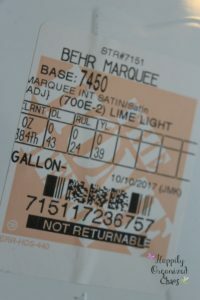 I went online to look on the Behr website for some inspiration and ideas and found THE perfect color….700E-2 Lime Light. Now it is an older color but it was like it was meant to be, the color was the perfect shade of mint that matched my bedding to a tee! I explained this to JoAnne and she grabbed the paint fan and we found the color. She quickly whipped up a sample jar and I was on my way. 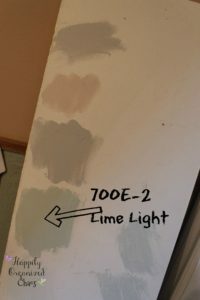 I went home and tried all the paint samples again on a piece of white board and decided that Lime Light was the winner but it was just a tad bit dark. That was no problem at all, The Home Depot Canada was able to half tint it and voila, the perfect minty blue green, perfect for a mermaid princess. I mean, you can not get a shade that is more perfect for the room. 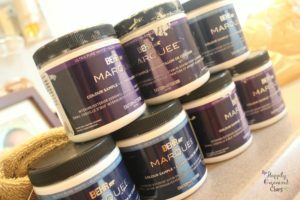 The paint that I chose to get was the Marquee line because of the fact that it claimed to be a one coat coverage. It also had so many other properties such as stain resistance, mildew resistance, stain blocker and the most important especially for a child’s bedroom, it is scrubbable!! I couldn’t be more happy with the quality and coverage of this paint. It went on so easily and covered dark areas on the walls left from shelving (you can not even tell the mark was there). Like I mentioned earlier I really dislike painting so to find a paint that I only needed to do one coat was truly a blessing. So how did I put this perfect paint onto the walls you asked? I ended purchasing a roller kit from The Home Depot Canada and couldn’t be more impressed by the quality of rollers and brush that was included but more than that I was floored by the price! 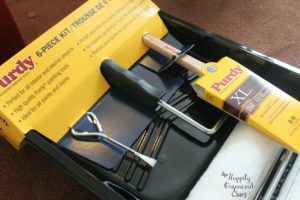 This Purdy 6 Piece Kit was only $31.99 and that included 2 rollers, a Purdy XL brush, 2 tray inserts, a tray plus a paint can opener. I usually buy cheaper brushes and throw them out when I am finished, but there is no way I am doing that with this brush. (This brush retails alone for around $25!!) It made painting so easy and I wasn’t constantly picking brush hairs off the walls. 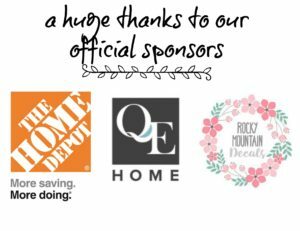 Again, I want to thank The Home Depot Canada for partnering with me on this challenge and I hope that you all take some time to check out all the other amazing transformations taking place during the One Room Challenge. 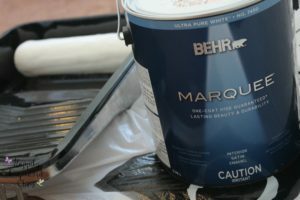 Disclosure: Home Depot provided me with gift cards to purchase the paint, but all thoughts and opinions are all my own. I am excited to see this wall color, it sounds just right for a little girl bedroom! 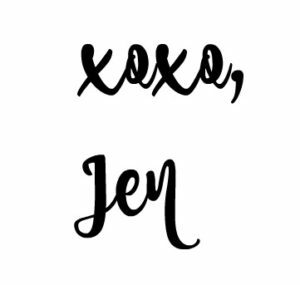 Paint is such a big component and often overlooked. I had trouble nailing down my final choice too, it was actually the last thing I had to decide on! I think it’s going to be perfect!! Your color looks like it is going to be so beautiful. I can’t wait to see it next week. Choosing a paint color is such a daunting task. Thank goodness for paint samples! Looks like you found the perfect shade. Look forward to next week’s progress report. I love that you picked limelight 🙂 I had a powder room in my previous home in that color. It will make your room feel light and bright. Everyone that visited always asked me for the color name and I must of said limelight a thousand times. It is still one of my favorite colors today!!! I’m excited to see how this is going to look on the walls! Love your choice of color and can’t wait to see it on the walls! And aren’t those Purdy brushes amazing?!! So glad you found your perfect mermaid-y colour. There’s nothing worst than painting with a colour that’s not quite right and either hating it or redoing after. So glad you got your perfect fit! 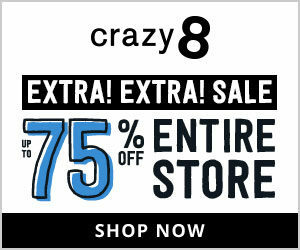 Ooh, I’m excited to see it up on the walls! Ooh this is going to be so pretty!